I just wanted to say thank you and to tell you that these books are amazing! I really appreciate you sharing these!! I just wanted to say thank you and that these books are amazing!! Thank you for sharing! Thank you for updating these! We look at these in sacrament meeting, and the kids were wondering when they’d have the 3 new apostles. Such a blessing! Thanks so much! I was hoping an update was available, but knew you have been busy with little ones. Thanks for taking the time to do this and post it! This is amazing. I am grateful for your talent and generosity!! Thank you so much for sharing your talents. We have used these for years and I am so happy to see the update! I just wanted to let you know that I used these for General Conference this year. I put each card on the outside of a bag and then a corresponding coloring page/treats inside the bag for my kids to work on during that talk. (I pulled information from the card you created and just found something that went with it. For example: attended Utah State – a picture of USU. loves animals – a coloring page of animals etc…) My kids loved it and I am so grateful for the time you put into making this resource available! For FHE the following Monday, we took turns shooting a basketball into a basket then picking one of the apostles and reading the quote at the top of the page. It was a great way to learn about the apostles and hear their testimonies. Thank you again! Hi, I would like to use these, but was wondering if your going to have an update? I’ll be happy to wait if one is in the works. I would love to know if you update this book with the new presidency! My family loves looking at it, especially around conference time! Thank you! THANK YOU!!!! When you get the newest two, would you let me know? I have used this book for my boys for years and we LOVE IT! These are fabulous and exactly what I am looking for. It is a perfect way to help our children in learning and knowing about our prophet and the apostles. Will you please let me know if & when you will be updating with the new prophet, first presidency, & apostles. I am very interested. My children love this book! Are you planning lb updating it? Thank you for these! This book has been one of our family favorites. Thank you for all your hard work in putting these together. You truly are blessing lives and strengthening testimonies. If you are updating these I’d love to hear about it. Thank you for these! We love our book. Any chance you will be adding cards for Elders Gong and Suares? We study these often, especially before conference! I absolutely love these cards. 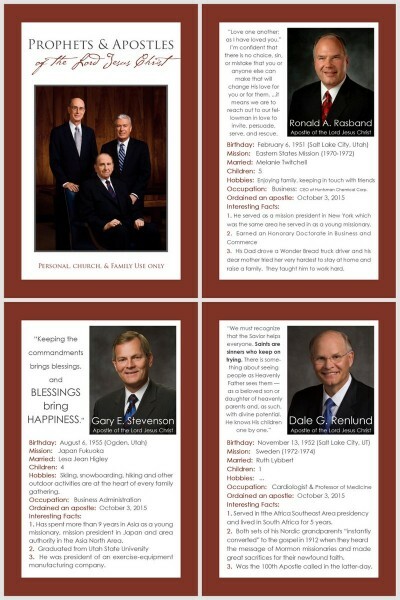 Do you have any thoughts on updating with the new First Presidency and the 2 new apostles? I’d love to know if you do. Thank you for sharing! I just wanted to thank you for these quiet books! My children have enjoyed them for years! I also wanted to let you know that I took your bio outline idea from the apostle and prophets book and created my own family history books. What an incredible experience it has been to find photos and interesting facts about my own ancestors and sharing those with my family. My children have become more familiar with the faces, names and short stories of those who came before them. I would love to update my book with the new presidency. Can you please email me if you update these? I have used these for years. Do you have an update with the new First Presidency and Apostles? Can you email it to me? Thank you! I have to echo the other comments – this has been a family treasure. Thank you so much for sharing your talents! My grandkids have loved this prophets book. You are amazing at what you do. Have you done anymore updates. Would love to send a copy to my grandkids. Thanks for your talents.